A burger is very attractive to draw, it is iconic. With three strokes, I can easily draw a burger but not lentils with chorizo. Check out his website. Sawe has a vast imagination with a mixture of an adventure-filled life in the city and his own science fiction comic, fantasy world. Everything started with a 3x4m wall in one of our most famous venues, Bacoa Universitat. Many ideas came up to find the right decoration until someone said a name: SAWE. 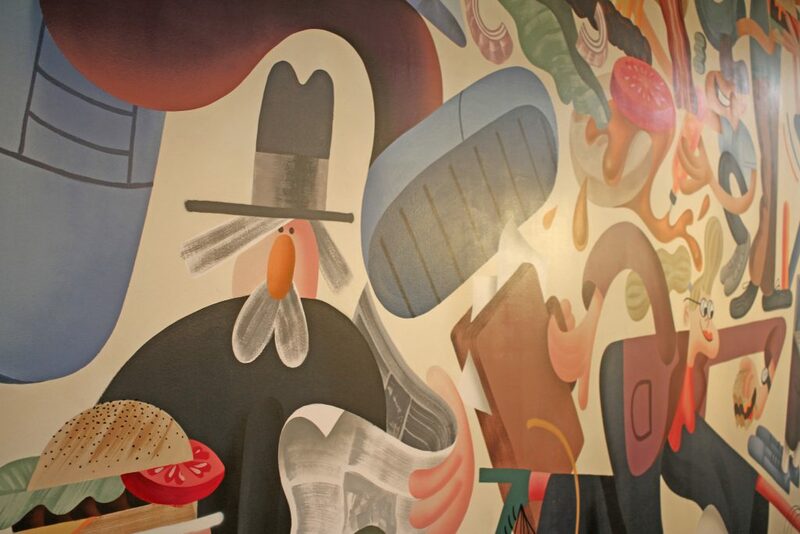 We immediately contacted this local artist and commissioned him to do an exclusive mural for our restaurant. It’s just a pseudonym that I had to use in order to be part of the graffiti world 15 years ago. Many people of this world know me by this nickname, so my real name is a bit encrypted. We know you’re able to give voice to walls and they have told us that you go crazy for burgers… What do you prefer, drawing them or eating them? Yes, I really love eating and drawing food. Besides being tasty, a burger is very attractive to draw, it is iconic. With three strokes, I can easily draw a burger but not lentils with chorizo. If I have to choose between drawing burgers or eating burgers, I’d rather not draw anymore and eat all the burgers I can (laughs). And if they come with fries and homemade sauces like yours, it’s even better. Graffiti artists tend to hide their identity. Why do you do that? Is it because you are worried the police will wake you up one day banging your door down? Luckily, Barcelona is quite relaxed about that, but there are sometimes investigations, so it is always better to prevent. I use the pseudonym SAWE legally, so I’m pretty quiet in that sense. The truth is that I try to hide my identity because I’m not photogenic at all (laughs). But I’m getting older and I’m caring less and less about that. Don't miss the mural made by SAWE in Bacoa Universitat. We've taken the inspiration from our loved customers: students, families, tourists, hurried business people, grandpas ... everyone is welcome to Bacoa! We love your style, it’s very personal and reminds us a little of our way to work, going back to the origin of what inspires you and transforming it into something cool and fresh as a cucumber. What’s the main inspiration behind your designs? Thank you! I think it’s important to build things on a simple and solid base, without being too sensationalist. In the kitchen, for example, if you fill the dishes with many ingredients you can get a big and nice dish but also very pretentious. I like simple and well done things. 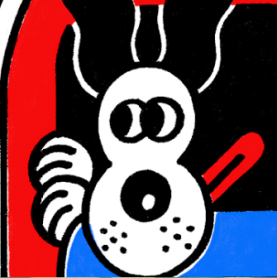 Bendik Kaltenborn, Brecht Vandenbroucke, Todd James, Andy Rementer, John Sfar, Buck, UPA, Leonid Shvartsman, George Dunning, Miguel Noguera, Louis CK and so on. 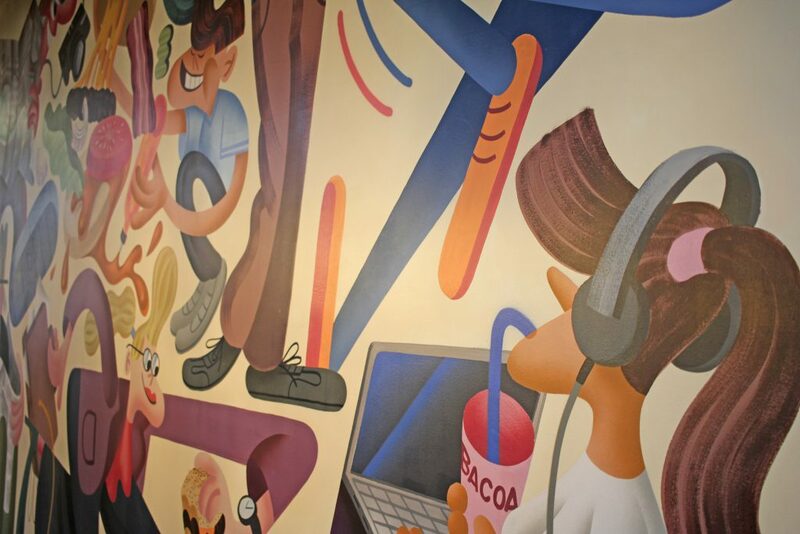 How was the process of creating the mural of Bacoa Universitat? Any stories? It has been a fluid process; first I drew a sketch and immediately you guys liked it. With the wall, I had couple of problems, because I wanted to mark the first lines with the help of a projector but there was not enough distance, so I had to us my intuition. In front of the wall there are lamps with hanging bulbs, which are very nice but it made my life more difficult. But the most difficult part was that I painted the wall at night when the kitchen was closed, so I couldn’t eat burgers in the meantime! Sawe has also illustrated the first edition of our fanzine. You can see it here.